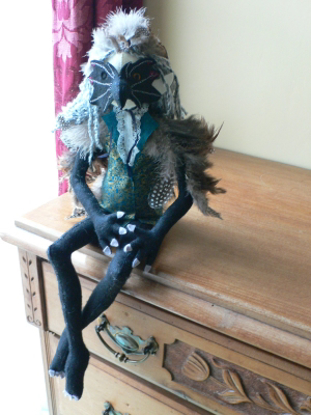 Individually handmade in Somerset, these beautiful faeries are designed to sit on any shelf in your house to watch over and protect you. Each Faerie is unique and has a name and character to match. There are also Dragons, Mermaids and Witches in this new range of collectors dolls. Made of felt and wool with a soft filling. Avian, a faerie spirit of the birds. With beak and feathers he looks like he will leap into the air at any minute! Sorry Sold!